- You’ll find the sign for this Contract on the Notice Board of Midcopse, a small village in the southwest of Velen. You’ll probably come here first during the quests for Keira, along the main path; you’ll find the Contract waiting for you by the entrance of town. - Speak to Ealdorman Bolko, just down the street. He’ll rather clumsily describe the job. Accept - and barter, if you wish - and he’ll send you to a woman named Agneta. She’s a bit further down the street. Speak to her for some clues about Jenny. - Head northwest out of the village and into the surrounding fields. You can find a bit of torn dress and tracks out here with your Witcher Senses. 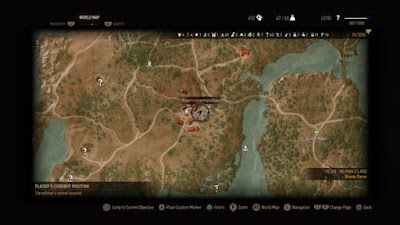 Follow the tracks to find a big patch of blood, which you can inspect for an Assassin’s Knife. Keep following the trail to find a conspicuous dig site, within which you’ll find a Letter Found in a Grave. - Read the Letter, then head back to Midcopse. Speak to Bolko and he’ll give you a location for the beast, then follow the waypoint to the northwest. You’ll find a small fire. Geralt will kneel to meditate until nightfall; set meditation until sometime in the evening (12 am or later will do nicely). Then get ready to rumble. Jenny’s a relatively fierce opponent, though mainly because she has a hell of a lot of health if you try to tackle her at low levels. Her attacks are easy enough to telegraph and avoid with a sidestep, but your own strikes won’t do a ton of damage to her in return - that is, unless you catch her in a Yrden trap. Do this and your hits will start the arduous process of properly chipping her down to size. Sidestep, get her in the Yrden circle, and strike her three or four times before sidestepping again. Repeat until she goes down. Occasionally Jenny will split into four, in which case you need to quickly destroy them all with a single blow apiece, as she’s healing herself. Your primary enemy here is getting overzealousness, and trying to hit Jenny more than three or four times per combo. Avoid this pitfall, hold back, heal as necessary, and swat her whenever you’ve flanked her. Jenny will go down in time. Use some Specter Oil if she’s really bothering you, but after a bit of practice you probably won’t need it. Check Jenny’s corpse for a selection of goodies, including a bunch of Nightwraith stuff, then head back to Bolko for your reward.